In April 2015 I was lucky enough to be offered a research assistant position with Clare Rusbridge, Chief of Neurology at Fitzpatrick Referrals, on the subject of syringomyelia in Cavalier King Charles Spaniels. After spending the summer taking thousands of measurements from MRI scans I was invited to spend a week at the practice with the neurology team to experience the day-to-day challenges of a specialist referral hospital. It is rare to be given a chance to see practice at such a renowned and busy referral hospital and to work on a one-to-one basis with the clinicians at such an early stage in one’s veterinary career so needless to say I was incredibly excited when I arrived at the practice bright and early Monday morning. Although keen to get stuck in I was slightly apprehensive about being a hindrance to the team due to my limited knowledge as a second year veterinary student compared to the fifth years and new graduates they usually have. It soon became clear that my worries were unfounded; all the staff from the auxiliary nurses and receptionists to Noel and the senior surgeons were so welcoming and friendly, always happy to answer my continuous stream of questions or point me in the right direction when lost in the maze of the practice. The neurology team in particular, comprised of Clare, Colin Driver & Anna Tauro, took so much time to patiently explain the specifics of diseases, surgical procedures, diagnostic imaging and treatment plans to me and encouraged me to ask questions, take initiative and get involved, all of which enhanced my experience immeasurably. As well as the great clinicians I met some lovely animals including Alfie the Hungarian Vizsla , whose tail always started thumping when you went to see him, and Max the Bull Mastiff, a giant slobbery teddy bear who had a weakness for tummy rubs and ear scratches. Seeing the spinal cord of a dog during surgery for the first time was an amazing moment, something that we’ve only been taught about in anatomy lectures and definitely not a sight I’m likely to see again soon outside of referral practice. I came away at each evening with pockets containing numerous unpronounceable names for diseases, medications and procedures scribbled on scraps of paper to look up, read into and learn more about, my thirst for knowledge fuelled by the cases of the day. On my final day I was given the opportunity to prep our patient for surgery including shaving the surgical site (making a perfect rectangle on a cat’s back is much harder than it sounds! ), scrubbing the freshly shaved area and expressing her bladder. It might sound simple but being handed those rubber gloves and being trusted with these tasks was truly exciting and reminded me that someday in the not too distant future I will be doing this unsupervised as a qualified vet. 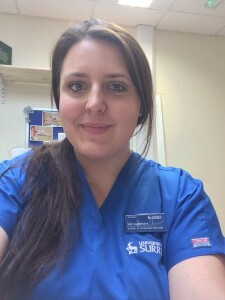 Hours later walking through the corridors of Fitzpatrick Referrals in my scrubs at 10pm with Anna having just come out of spinal surgery I couldn’t help the smile spreading across my face – I’d worked 65hrs in 5 days, stood in surgery until my back ached, had been slobbered on, weed on, covered in dog hair….and I couldn’t be more certain that this is what I want to do for the rest of my life. My time at the practice really reminded me why I have chosen this path, what I’m working towards and the possibilities ahead of me if I push myself to be the best I can be. The week I spent working alongside this incredible team was truly unforgettable and I cannot wait to return for clinical rotations in fifth year with more knowledge and skills to put to good use.